Uhuru recollects Mark Too’s role in his presidency – Kenyatta University TV (KUTV). All Rights Reserved. Mourners were moved by President Uhuru Kenyatta as he recalled how the late Mark Too played a key role in his entry into politics. 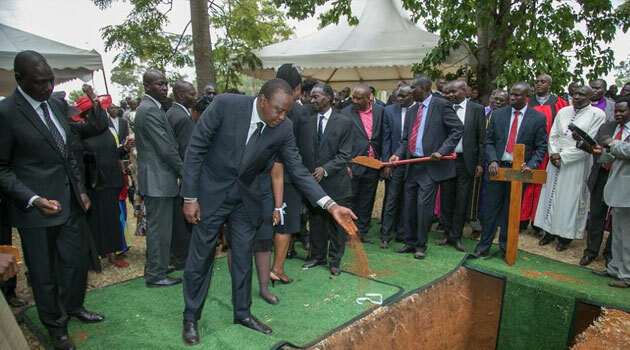 Uhuru told hundreds of mourners that if it were not for Mark Too, ‘things would probably have turned out different’ and he would not have risen to the country’s top seat. The President remembered how the influential former nominated MP convinced him to join politics in 1997, saying it was the only way he could bring about change in the country. Despite of Uhuru being very reluctant to join politics he decided to try his luck in elective politics after some prodding by Too and former President Moi. “I decided to try in 1997 but I was defeated as the people of where I came from at the time did not want to hear of KANU. After I was beaten I resolved to do away with politics but Too and Moi kept on asking me to try again,” he said. Outside parliament, Uhuru recalled seeking Mark Too’s advice on how to get a political platform. Too, popularly known as Bwana Dawa, told him he could take one of the nominated MPs slots at the time held by a Mombasa politician whose identity he did not reveal. “I asked him how I was going to do it. He told me there was a seat held by the man from Mombasa,” Uhuru said. Later that evening, Moi called to say that Too had agreed to surrender his nominated slot.